Having grown up in an army family, acronyms and military jargon (like AWOL — absent without leave) were a daily part of life. One of my first encounters with Japan’s 兵語 (heigo, military terminology) came about when Kato-san, an older co-worker, jokingly made a reference to the term M検 (emu-ken, an “M inspection”), which in the old days doctors performed at military induction physicals to look for visible symptoms of sexually transmitted disease. Ken, I supposed, was short for 検査 (kensa, test or examination). But what did the M stand for? Then Kato-san drew a letter M on a sheet of paper, and I immediately understood it to be a crude depiction of the anatomical shape of the, er, object being examined. 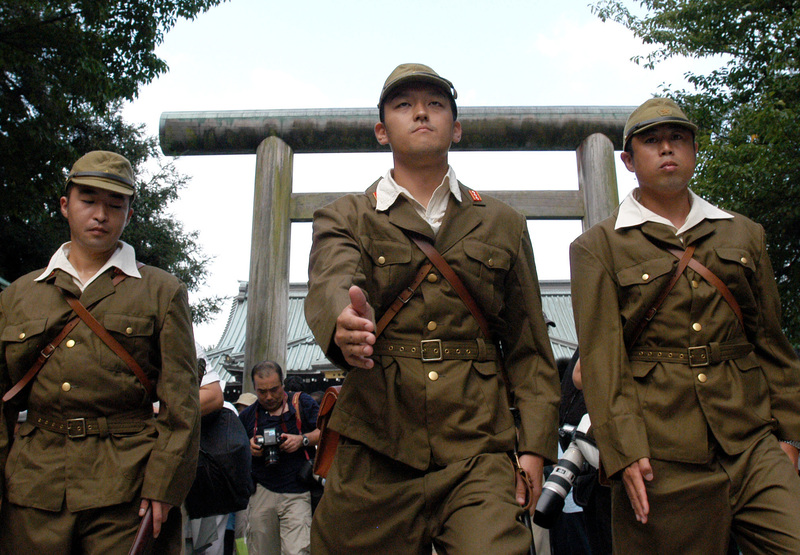 On a more serious note, because so much news coverage this summer is being devoted to the 70th anniversary of the end of 第二次世界大戦 (Dainiji Sekai Taisen, World War II), I’ve complied an overview of the words, phrases and concepts that found wide usage up to 1945, and which still crop up in news articles, TV period dramas and documentaries. Between 1889 and 1947, Japan’s official name was 大日本帝国 (Dai-Nippon Teikoku, literally the Empire of Great Japan), just as 大英帝国 (Daiei Teikoku) referred to the British Empire. With the country’s growing imperial ambitions came some undesirable baggage: 超国家主義 (chōkokkashugi, ultranationalism) and 軍国主義 (gunkokushugi, militarism), which led to 結集 (kesshū, regimentation) and 教え込み (oshiekomi, indoctrination) of the population, beginning from an early age. Every primary schooler was obliged to memorize and recite the proclamation, issued by Emperor Meiji in 1890, called the 教育勅語 (kyōiku chokugo, Imperial Rescript on Education), which reminded him or her of duties and obligations as a subject. A key passage went 一旦緩急アレバ義勇公ニ奉ジ (ittan kankyū areba giyū kō ni hō ji, “Should an emergency arise, offer yourselves courageously to the state”). Typical wartime slogans included 滅私奉公 (messhi hōkō, “Deny the self, serve the public”), 贅沢は敵 (zeitaku wa teki, “Indulgence in luxuries is our enemy”) and 電力は戦力 (denryoku wa senryoku, “Electric power is fighting power”). Western fashions were regarded as superfluous and decadent. 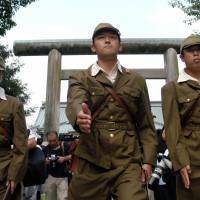 Teachers and other public figures went about their business wearing the Japanese version of China’s “Mao suit”: brown- or khaki-colored tunics referred to as 一般国民服 (ippan kokumin fuku, wartime civilian clothes). As the war dragged on, food shortages and other hardships became widespread. Small-denomination ceramic coins, called 陶貨 (tōka) were minted to conserve aluminum. While a few 戦争成金 (sensō narikin, war profiteers) flourished, 配給 (haikyū, rationing) became common and many basic commodities, such as rice, sugar and cooking oil, were available only by 切符制 (kippu-sei, the ration-card system). When gasoline supplies became depleted, cars were modified into 木炭自動車 (mokutan jidōsha, vehicles that ran on charcoal). To enforce conformity and stifle dissent, people accused of lacking in sufficiently patriotic spirit were tagged with the epithet 非国民 (hikokumin — literally, “non-citizen”). Japan’s enemies were often referred to as 鬼畜 (kichiku, “demon-creature”), originally a Buddhist term meaning “brute” or “beast,” expanded to 鬼畜米英 (kichiku Beiei, bestial Americans and British) or 鬼畜米帝 (kichiku Beitei, bestial American imperialists). While traditional tunes were not banned outright, recording companies cranked out plenty of 軍歌 (gunka, martial music), such as the mournful naval dirge 海行かば (Umi Yukaba, “If You Go to the Sea”), 同期の桜 (Dōki no sakura, “Cherry Blossoms from the Same Military Academy Class”) and 月月火水木金金 (Getsu, getsu, ka, sui, moku, kin, kin, “Monday, Monday, Tuesday, Wednesday, Thursday, Friday, Friday”), whose message was that there were no days of rest for a fighting man. The print media and cinema, needless to say, were subject to strict 検閲 (ken’etsu, censorship). Another policy, imposed in many sectors of society from 1940 onward, banned the use of so-called 敵性語 (tekiseigo, enemy language), which was extended to cover many non-native word borrowings. In sports, the term changed from スキー (sukii, skiing) to 雪滑 (setsukatsu, “snow sliding”), and スケート (sukēto, skating) became 氷滑 (hyōkatsu, “ice sliding”), to give two examples. In radio broadcasting, アナウンサー (anaunsā, announcer) became 放送員 (hōsōin, broadcaster) and マイクロホン (maikurohon, microphone) was 送話器 (sōwaki, “send-speech device”). Phonograph records were changed from レコード (rekōdo) to 音盤 (onban, “sound disc”). The names of foods received similar treatment. コロッケ (korokke, croquettes) were renamed 油揚げ肉饅頭 (abura-age niku manjū, deep-fried meat buns). And カレーライス (karē raisu, curry over rice), a staple on Japanese navy ships, was dropped in favor of 辛味入汁掛飯 (karami-iri shiru kake meshi, spiced gravy poured over rice). In music, a piano became 洋琴 (yōkin, a “foreign lute”). And despite the fact that Italy was a fellow 枢軸国 (sūjikukoku, Axis power), even the almost universal “do-re-mi” musical scale was changed to ha-ni-ho-he-to-i-ro-ha. For those wishing to expand their military vocabulary, I’ve assembled a separate glossary of useful terms that can be found below.